QUINCY is an intimate look into the life of icon Quincy Jones. A unique force of nature in music and popular culture for 70 years, Jones has transcended musical and racial boundaries; his story is inextricably woven into the fabric of Black America. Beyond his own acclaim as a trumpeter, producer, conductor, composer and arranger, Jones’s inimitable gift to discover the biggest talents of the past half of the century is unprecedented. He has mentored and cultivated the careers of young talents, from Lesley Gore and Michael Jackson to Oprah Winfrey and Will Smith. With his boundless energy, Jones has also awakened many generations to the significance of humanitarian issues. QUINCY captures the kind of life that can only belong to a man with a big heart and an even bigger will to live forever. Directed by Rashida Jones (Angie Tribeca and Hot Girls Wanted) and Alan Hicks (Keep On Keepin’ On), QUINCY, a Netflix original documentary, seamlessly threads personal vérité moments with private archival footage to reveal a legendary life like no other. 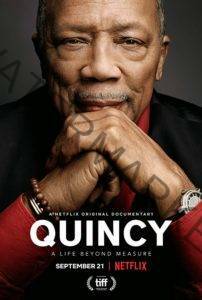 If you like what read about Quincy, please remember to share Netflix New Releases on Facebook, Twitter or wherever you guys want it’s all appreciated.